5 of 10 (50%) reviewers would recommend this product to a friend. Dogtra is proud to introduce their new dog friendly bark collar called the Dogtra iQ No Bark Collar. This collar will vibrate before any correction is given. This means fast learning with less correction. The contact points are made of conductive plastic for dogs with sensitive skin and is designed to fit the dog's neck ergonomically. 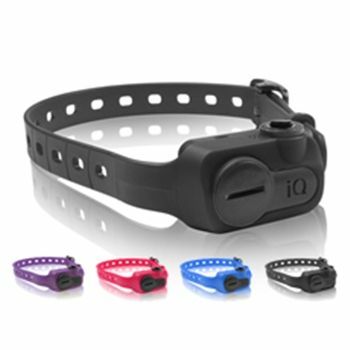 The contact points are attached on a collar that has a smaller receiver and is made to fit dogs of a wide variety of sizes. Control barking a different way. It is recommended that when introducing the iQ No Bark Collar to your dog, begin with the lowest level of correction. If the dog continues to bark, gradually increase the intensity level slowly, as needed. Your dog’s first sign of recognizing stimulation might be a head tilt or an ear twitch. Once you notice a sign that your dog feels some form of stimulation where you need to start your dog at. The LED Indicator will flash for 1 second when the iQ No Bark Collar is ON and every 2 seconds afterwards. If your dog does not bark for over 10 seconds, the LED Indicator will turn OFF and the iQ No Bark Collar will go into a "Sleep Mode" to conserve battery life. It will reactivate when your dog barks and a vibration or correction needs to happen. Non-Stimulating Pager/Vibration Mode: occurs when the Intensity Dial is set to P and the dog barks. The iQ No Bark Collar will vibrate twice. The On/Off & Intensity Dial on the collar is used to turn the iQ No Bark Collar On and Off, to select the intensity level, and to test the No Bark Collar. Set the On/Off & Intensity Dial to the “Off” position to turn off the iQ No Bark Collar. When the dial is set to the Pager Mode (P), the collar will only vibrate. Level (1) is the lowest stimulation level with level (10) being the highest. On each level, a vibration is followed by the stimulation. Set the On/Off & Intensity Dial to the Test Mode (T) to test the iQ No Bark Collar. Download the Operating Manual and Guide for directions on how to test the iQ No Bark Collar. Summary:I think the design of this product was well thought of. I’ve used another collar before from a competitor brand and the Dogtra IQ fits better on my dog than the previous one. My dog seemed uncomfortable whenever he wore the previous collar. Also, this collar has some new tricks up its sleeve. I love that this collar vibrates before it gives any correction. If you’re lucky enough and your dog will respond to even the vibrate (like what happened to my dog), that means you will not have to always use the correction on your dog. There’s a test mode on the collar which is also very helpful. There are 10 levels of correction which can be easily adjusted. Be sure to read the manual first before using it. Start at the lowest setting and if your dog still barks, increase the correction level slowly until you see any signs on your dog that he can feel the correction. Summary:I’m very satisfied with this product. It has operated the way that I expected it. My dog usually roams around without any leash. We have already trained him to stay within his boundaries using an electronic dog collar. We use the IQ Bark Collar to train him not to bark too much. We have already successfully trained him with this collar also. We just let him wear this at home to reinforce our commands since he has already been well-trained. What’s nice about this collar is that we don’t have to carry around a remote around the house. It is very easy to operate. Not much complicated stuff to work around with. Recommended! Summary:This collar is wonderful! It has been a lifesaver to us. We have two dogs and both love to bark at just about anything. Our neighborhood is very much alive so there are a lot of things that our dogs can see. They bark at whatever they want, whenever they want to. Before finally trying out this collar, we’ve tried other methods. We’ve tried other expensive collars but nothing really worked on them. This was the first collar we’ve tried that actually worked. Compared to other expensive rechargeable collars, this collar for us is way better. Aside from being very gentle, it is also very gently on our dogs’ necks unlike one expensive model which irritated their necks after several use. I highly recommend this collar. Summary:Ever since we got our new dog, there was too much noise at our house. I never really understood what made her bark but she did barked a lot. Our neighbor even complained one night since she was barking continuously. But everything changed the moment we used the Dogtra IQ on her. It fit her perfectly! The vibrate warning feature worked on her like a charm. Although there are times when she gets too excited that she gets past the vibration warning but the correction stops her from barking more. I think it only took us 2 days to completely control her barking. Now, I only place the collar on her neck just as a reminder. We don’t actually switch it on since she doesn’t bark too much anymore. I love this product! It helped us solve our problems with our dog. Summary:My dog barks at just about anything he sees. But his favorite is other dogs. Whenever he sees another dog, he would bark his heart out. There’s just no stopping him. I bought this product which was recommended to me by a friend. Even the first correction had a great effect on my dog. It only took a few more zaps until he finally understood what would happen if he continued barking. The vibration warning wasn’t really that useful to my dog but I think it’s a great feature for dogs that would respond to it. I’ll keep this collar and will use it on another dog if needed. Thanks Dogtra for a great product! I highly recommend this bark collar.